Open-source image processing tools are rapidly spreading across programming languages and scientific domains. The widely-used ImageJ platform, along with its distributions such as Fiji, offer an excellent Java-based suite. In the last few years, image processing and computer vision in Python has rapidly matured1 with the emergence of libraries like scikit-image, Mahotas, and SimpleCV. scikit-image and Mahotas utilize 2d NumPy arrays for their image data structures, thus providing a familiar API to users of NumPy and the other core SciPy libraries, especially Matplotlib, IPython. The motivation for pyparty arose from difficulties encountered when quantifying nanoparticle distributions on silica substrates. We had found that after acquiring an image, preprocessing, segmentation and labelling techniques were easily applied; however, separating and measuring the various particle species in post-processing was difficult. This is primarily because the objects of interest were stored as boolean or integer-labeled arrays, which become unwieldy under heavy manipulation. pyparty emerged as a means to abstract the concept of particles (i.e. image blobs) into custom data structures for intuitive manipulation and characterization whilst preserving the image API. In addition to integrating new particle constructs with the existing array and image processing functions, pyparty extends scikit-image’s rasterization toolbox with new particle types, patterning, and an interface to Matplotlib patch objects for vectorized particle renderings. Thus, pyparty leverages the conventional imaging pipeline at both ends; it provides a tool set for artificial image composition, and a framework for particle post-processing. Rasterization, as well as particle labels and descriptors (e.g. area, eccentricity etc...), are all deferred to algorithms implemented in scikit-image. pyparty adds a convenience layer to extend some of this functionality. For example, pyparty’s implements a Grid object for patterning, and provides a simple framework for drawing multiparticles, for example circle dimers and trimers. The Canvas is pyparty’s primary datastructure. The Canvas is comprised of a background image, a Grid and ParticleManager, which is a container for particle storage and manipulation. The Canvas fully decouples particle information such as position, color, and pixel from the background image. Since particle information is stored in python containers, slicing, arithmetic, boolean indexing and other common operations are very easy to perform. For example, an operation like dilate all circular particles in an image that are over a certain size and mean brightness is a simple task in pyparty. 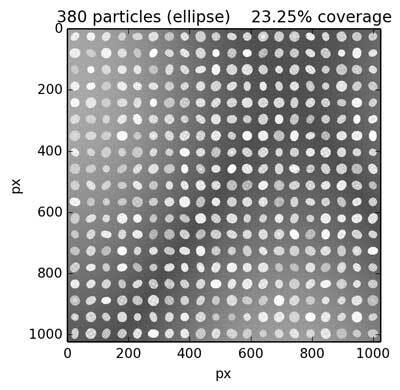 In addition to the Canvas, the MultiCanvas is provided for images with multiple particle types. Finally, pyparty simplifies some common image processing tasks involving thresholding, artificial noise generation, color assignment, image type conversions, plotting and blob filtering, albeit not to the extent of IJBlob. We will first highlight pyparty’s drawing capabilities to create pseudo electron microscope images. A more involved version is used to compare segmentation algorithms in a corollary study. In the example code snippets, Canvas and MultiCanvas methods are bolded for clarity. To begin, let us define the parameters corresponding to ranges for particle size and intensity, the noise fill-fraction and the image resolution. For brevity, we load a previously generated pyparty background image (see documentation) of a trigonometrically-varying contrast gradient. The Canvas crops the image to our desired resolution upon initialization. Next, randomly-sized ellipses are added, and the Canvas grid is set to 20 pixels per division; this controls the inter-particle spacing. 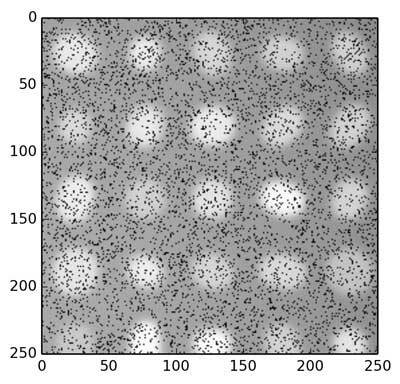 This results in 380 particles covering 23% of the image surface as shown in Figure 1. Next, we apply a Gaussian filter through scikit-image (σ = 3px) to smooth the particle boundaries. This negligibly affects the background, which varies over a much larger scale. In pyparty, spectral noise can be assigned according to any NumPy distribution function (Gaussian, gamma etc..), but for clearer visualization, we'll use black pixels, also known as "pepper" noise (see Figure 2). Randomly sized ellipses drawn using pyparty's Canvas and gridding. Zoomed view of particles after smoothing and adding black noise. As a final exercise, we employ the MultiCanvas to characterize nanoparticle species in an electron microscope image. The image, which is packaged with pyparty, has been segmented using Ilastik's object classification workflow into groups labelled as singles, dimers, trimers and clusters as shown in Figure 3. pyparty has an API for shape filtering, but it is not explored here. The MultiCanvas is built directly from the image via the from_labels() constructor. Persistent names and colors are assigned to the labels for easier identification between plots. Figures 4 and Figure 5 shows pyparty's decomposition of the image into these colored particle groups. Bundled image of gold nanoparticles on a glass surface, grouped into four color-coded categories: singles, dimers, trimers and clusters. Separation of particle families based on color. 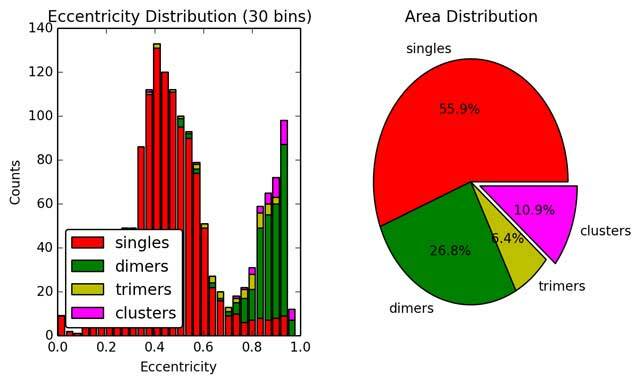 Eccentricity and area distribution of families of nanoparticles. Development and testing is performed on Mac, Linux and Windows 7 systems. Tutorials and case studies are provided as IPython notebooks, which are also integrated into a quasi regression test suite. pyparty runs on operating systems that support Python and the numpy stack. It has been tested on Ubuntu 10.04, 12.04, 13.10; Mac OS X 10.7, 10.8, and Windows 7. Python 2.7; some features of pyparty may be inaccessible on older versions. pyparty has not been tested for Python 3 compatibility. At least 4GB RAM is suggested for working with multiple high-resolution images. scikit-image, Matplotlib, Traits. IPython2 is required to run notebooks; static versions are provided as well. We recommend Enthought Canopy for a powerful scientific computing environment with intrinsic notebook support. Fall 2013; some legacy code hosted since 2011. Although developed in the context of nanotechnology, pyparty’s post-processing and drawing capabilities are general to 2D imaging workflows, especially those found in microscopy3. pyparty is currently used for in-house research pursuits and continues to develop. 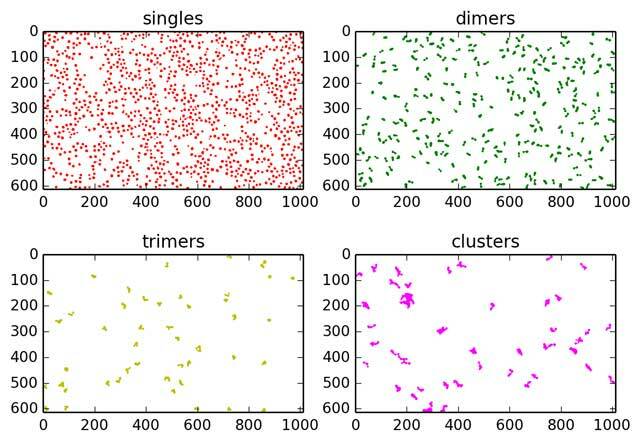 New applications like Ilastik integrate semi-supervised learning and object classification tools with unprecedented accessibility. This trend suggests that the need for general particle analysis tools will increase in coming years. 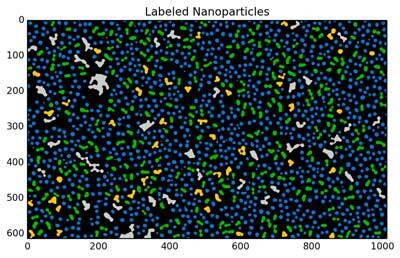 As image analysis in Python continually expands to meet the needs of researchers, we believe pyparty will emerge as a small but important component in particle analysis workflows. 1 SciPy’s ndimage collection pre-dates scikit-image for example. 2 Cell profiler is a great example of a specialized microscopy application in Python. Thank you Annie Matsko for excellent revision suggestions. I'd also like to thank the scikit-image team for several helpful discussions that ultimately inspired this project, and for their exhaustive efforts in creating a superb library. Coelho, L P (2013). Mahotas : Open Source Software for Scriptable Computer Vision. Journal of Open Research Software 1: 1–7. Oliphant, T E (2007). Python for Scientific Computing. Computing in Science & Engineering 9(90) Available at http://numpy.org. Hunter, J D (2007). Matplotlib: A 2D Graphics Environment. Computing in Science & Engineering 9(90) Available at http://matplotlib.org. Reeves Lab (2014). SEM Imaging of Nanoparticles: A case study, Available at https://github.com/hugadams/ imgproc_supplemental. Burger, W and Buege, M (2009). Principles of Digital Image Processing: Core Algorithms. London: Springer- Verlag. Jähne, B (2005). Digital Image Processing. 6th ed. Heidelberg: Springer-Verlag. Reiss, T H (1993). Recognizing Planar Objects Using Invariant Image Features In: Lecture Notes in Computer Science. Berlin: Springer. Hughes, A (2014). Github Example, Available at http:// nbviewer.ipython.org/github/hugadams/pyparty/ blob/master/examples/Notebooks/JORS_data. ipynb?create=1 [Last accessed 5 August 2014].